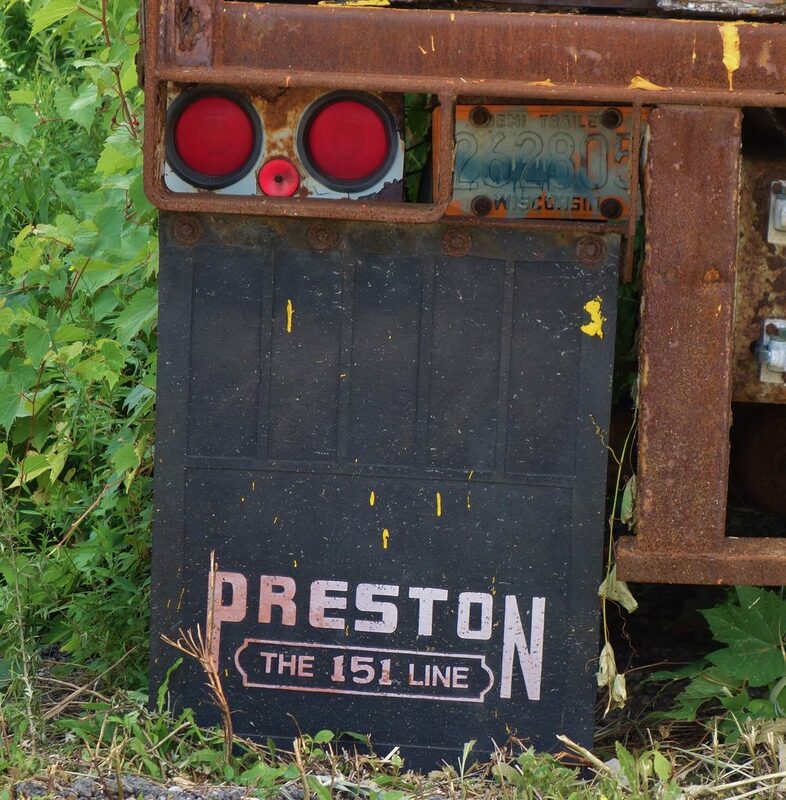 Preston, the 151 line. While the company is now a fallen flag it once had a service territory that included much of the country found east of the Mississippi River. It was difficult to travel any stretch of interstate and not see their name in large block letters traversing the length of a trailer. As with many LTL companies pup trailers, doubles, and even triples were the preferred combination. Here we see the mudflap of Preston truck. In the early 1930’s it was determined by ownership that a tag line was needed to help differentiate the company from it’s competitors. It was observed one day that 151 pieces of equipment made up the the growing giant that was Preston. The rest is history. Remnants of the company can still be found at a local moving company in the Syracuse area. 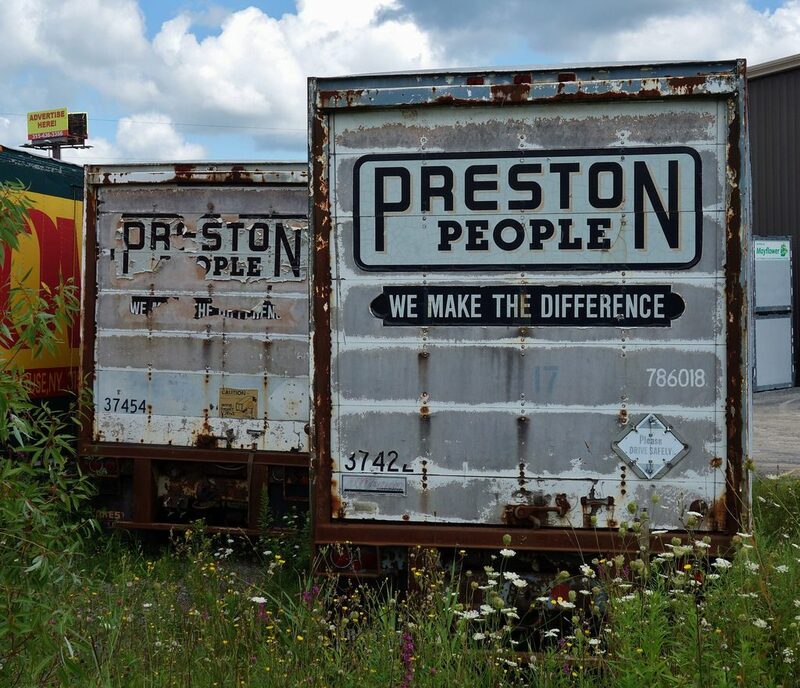 They must have bought the entire contents of the local terminal as they have no less than 30 trailers around the property wearing the once proud Preston name. All that history brings us right up this moment in time. You have may have noticed that content on this website the past few weeks, months, and most of the year has been slow to appear. The reason being? A baby. For the past nine months my wife and I have been anxiously awaiting the birth of our first child, a son. As you might have guessed, his name is Preston. Now I never set out to name my kid after a defunct truck company but one fateful day my newly pregnant wife crossed paths with a flight attendant named Preston. She came home with the name on the shortlist and when I mentioned that it was also the name connected to trucking history Preston just continued to hang around while other names fell off one by one. It became official this past Sunday, 11/11 at 9:40AM when Preston joined our family. Please continue to hang in there with me as navigate early parenthood and find away to keep a few post a week on this aging part of the internet. This entry was posted in Free and Easy. Bookmark the permalink. Congrats, Hope all are doing well. I check your. site daily, if it’s the same as the day before I look at older posts. Thank you Bill. You bring up a good point. Nearly 8 years of old posts to browse. Congratulations Eric and also to your wife!! I remember my firstborn and yes it’s a real life changer, but also worth than anything in the world! My first is 28 years old now and I still remember the day she came into our lives, like it was yesterday. Treasure this time, because your first child’s birth is a real special time. God bless all, now three of you. Congrats!!!! Please post some pictures.. Thank you! I just have to find the right background (truck) for the photos. Awesome and congratulations to you two! Thank you Clarence. Attendance to the 2019 Uncle Sam show has just increased by one! congratulations eric. lets see what our future truck driver looks like. Thanks Jack. Hope all is well. Congrats on the kiddo! I can imagine the tolls parenthood can take on one’s hobbies; I appreciate what you do here, and still look forward to reading your posts going forward. Thank you Jake. Slowly but surely we are starting to settle into a routine. Sleep however is still in sort supply. Congratulations to you and your Wife Eric! Welcome to the world Preston. Much to choose from on ebay! Now you’ll have another truck nut to tag along on your adventures. Congratulations! I follow your site regularly and always enjoy it. This is hands down my favorite post. What a special time in your lives. Welcome Preston. Very nice . Thank you friend. He has assumed all her best traits so far! Congratulations, 151 Times. Eric, it shows that your wife is always interested in your hobby almost as much as you. I think you will adjust to Preston being a great addition to your family. I would bet that your wife might have felt him shifting gears when dad was photographing truck. Maybe not? My wife has always been very supportive of my hobby. He was a very active baby in the womb and not much has changed since his arrival! Congratulations! I hope you raise him to love Detroit Diesels. There can be no other way. Congrats Eric, what a fitting story for the newest member of your family! Hopefully he will appreciate the history as much as you do. I will look forward to forthcoming posts as I always do, but I hope you enjoy this priceless time to the fullest. Congratulations Eric! All the best to you and your family.